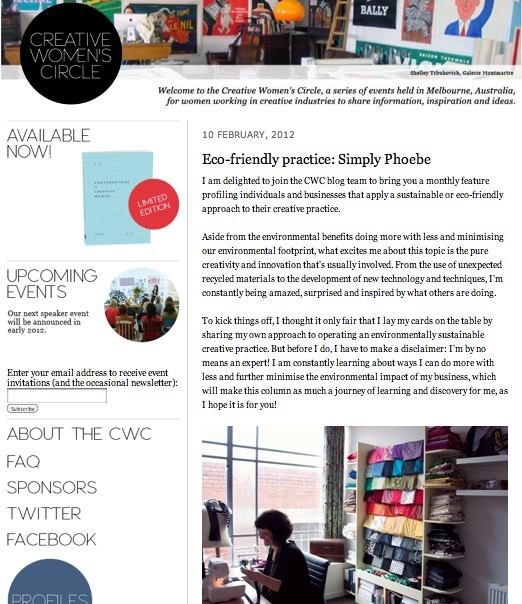 Anyone who knows me or follows my blog, twitter or facebook, would have heard me sing the praises/ bang on of the Creative Women's Circle aka CWC. This Melbourne-based events series/ networking group for creative ladies has been an amazing source of inspiration, motivation, support, friendship, work and more for me. Given my enthusiasm for everything CWC, I jumped at the opportunity to join a new roster of regular columnists on the CWC blog. My monthly column focuses on eco-friendly creative practices. I will be profiling different individuals and businesses who are making an effort to do more with less and/ or minimise the environmental impact of their creative practice. You can check out my first post here, where I have used myself as a guinea pig. I'm on the hunt for subjects for my upcoming columns. As well as profiling creative ladies doing good things with their creative practice or business, I'm also keen to know about any resources out there that can help us all improve our efforts. If you have any tips, please get in touch!